Whenever we get a huge butternut squash in our Greenling local box I like to roast and purée it on the weekend, in preparation for the week ahead. The entire process takes less than an hour, and I can use the ready-made squash purée in recipes like Macaroni and Cheese and Coconut Curry Pumpkin Soup on busy weeknights. 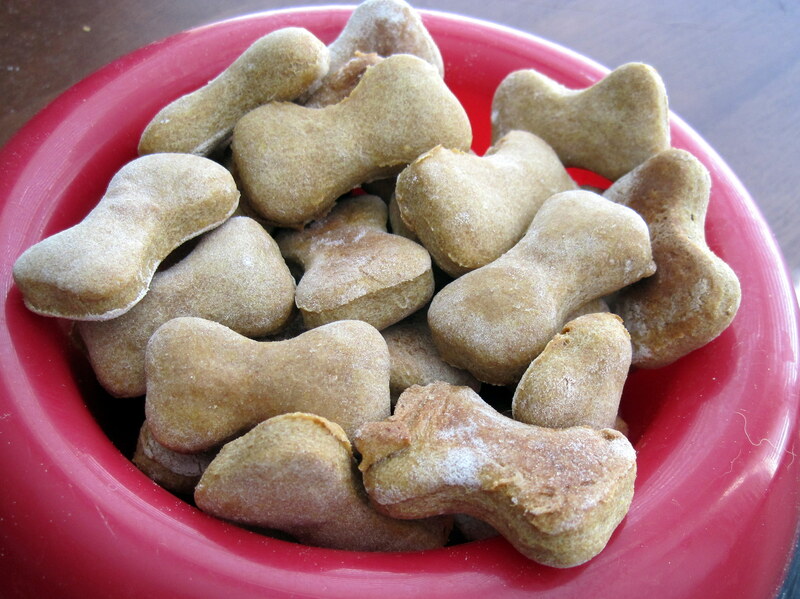 If there’s any leftover purée, I like to make these fast and easy treats for my dog Barclay. That way none of my local produce goes to waste, and Barclay gets to enjoy the squash, too! Update 10/30/10: Tara over at Let’s Talk Cookies tried these and found that baking the treats at 250 degrees for 2 hours results in a crunchier biscuit. I haven’t tried this myself, but it sounds like a good idea! Tip: the process for roasting pumpkin, butternut, or delicata squash is the same. These hard squash are interchangeable in most recipes, and you can even substitute sweet potatoes in a pinch. A great demonstration of how to cut, roast and purée a butternut squash is found here. Preheat oven to 350 degrees. Mix eggs, squash and peanut butter in a large bowl. Incorporate flour until you have a stiff, dry dough. Knead with your hands if necessary. (This dough is much drier than cookie dough for humans, about the consistency of pie crust.) Roll the dough out with a rolling-pin on a floured surface until it is 1/2 inch thick. 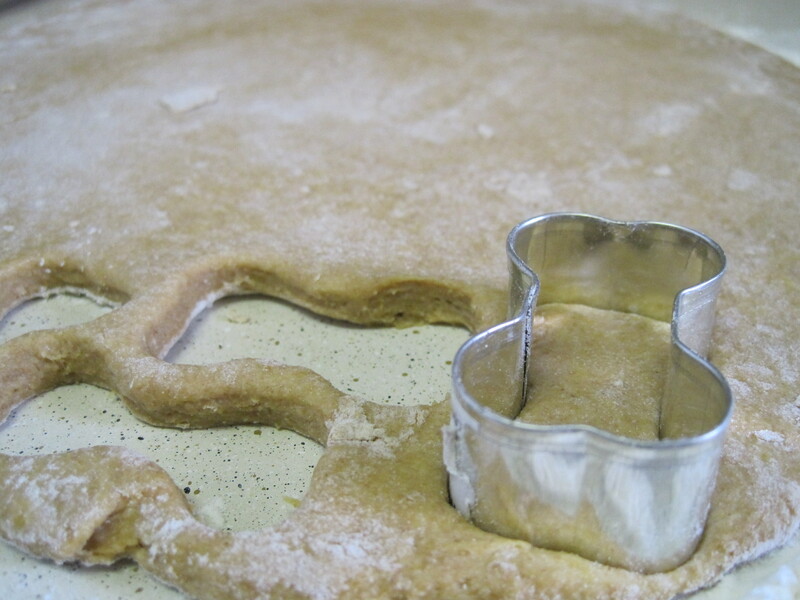 Cut with the cookie cutter of your choice, or just use a knife to cut the dough into 1/2 inch squares. I found this one by one-half inch bone-shaped cookie cutter at Zinger hardware for 50 cents. Bake the treats on greased cookie sheets until hard, about 25 minutes. Move to a wire rack to cool. 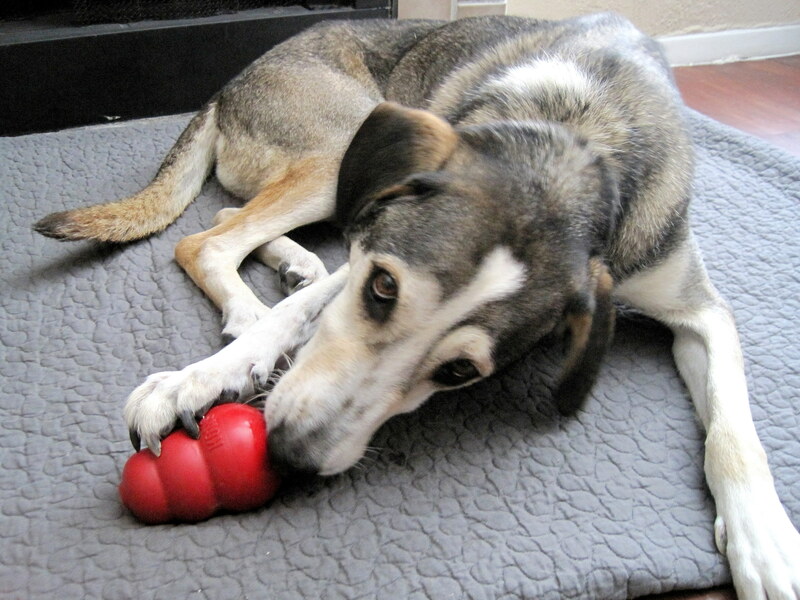 These treats make great Kong puzzlers and are much cheaper than commercially-packaged dog biscuits. Barclay likes to give packages of these treats to his friends for birthdays and holidays. Of course, you should check with your vet if you have any questions about your dog’s diet. These treats are vet-approved for Barclay! This entry was posted in For the animals, Vegan, Vegetables and tagged Butternut squash, Puree, Squash. Bookmark the permalink.